We’re just one week away from our big adventure of 6th Grade Camp! In this week’s post, write at least 2 paragraphs answering all three questions. 1) What is the one thing you can’t wait to try or experience at camp? Describe it, and explain why. 2) What is one thing you hope to avoid or doesn’t happen to ruin your camp week? Describe it, and explain why. 3) What will you miss from home or school? Describe it, and explain why. If you are not attending camp, change “at camp” to “at school” and adapt your opinion to your situation. 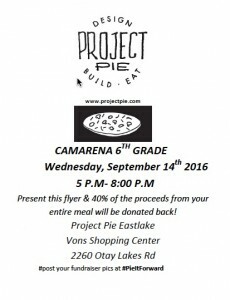 Camarena’s 6th Grade will be having it’s fundraiser with Project Pie on Wednesday, Sept 14th! Please see the attached flyer for more details and pick up a pizza to support our students. Money raised will be going towards our 6th Grade account to help pay for field trip busses to 6th Grade Camp and more. Thanks for your support!! Happy Presidents’ & Valentine’s Day! Please take a moment to review some important details about Camp, Eastlake Middle School, and Parent Conferences. 6th Grade Camp > Feb. 22-26 …. One week to go! Camp Store money deposits – The last day I’ll accept any cash towards your child’s Camp Store purchases will be Friday, Feb. 19th. Students are not limited to how much they deposit. Any leftover money will be returned to the child at the end of camp. I WILL NOT BE ABLE TO ACCEPT MONEY THE MORNING OF CAMP! Camp Equipment & Clothes – Please review the list of appropriate items to pack and NOT pack. The weather has been unusual since January. Layers are recommended. 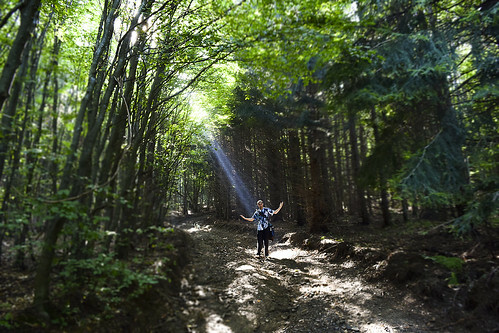 No electronics of any kind – phones, iPads, digital cameras. Disposable cameras are ok. Students are expected to carry their own luggage. Pack what is necessary, not just what they want! Medications – All medications need to be in sealed containers with the prescription label. If your child gets sick the weekend before camp, any over-the-counter medication needs to be in the original packaging and appropriate for their age. Students may not even have cough drops in their possession. All meds will be collected by our school nurse and kept at the Camp Marston Health Office. Parent Letters – You will be able to turn in as many sealed letters to your child as you’d like, with me on the morning we leave. Some parents write on each envelope, the day of the week they’d like their child to read the letter (ie. Jane Smith-Monday, Jane Smith-Tuesday..etc). This is a great way for younger siblings to say “hi” to their brothers or sisters. If you forget, another mail delivery may be collected at Camarena in the middle of the week, and our principals may bring these up during their visit. Please DO NOT directly mail to Camp Marston, because it will not get there in time. No care packages please- letters only. 6th Grade had an hour-long orientation of Eastlake Middle School onFeb.11th. Your child has an important packet to share with you about selecting his/her 7th grade elective. All the details are in the packet. A minor mistake: please DISREGARD any stapled orange slip regarding Dual Immersion. This was a mistake on the middle school’s part. For parents interested in learning more or visiting the campus, a separate parent orientation will be held at Eastlake Middle on March 3rd for Camarena. All registration packets can be turned in to Mrs. Hughes by March 9th. Please save the dates of March 10-18. These will be Parent Conference days. This time, your child will be in charge, making a presentation of their learning. A separate Google Form will be emailed soon, for you to choose your conference day & time. Math > Module 4 Expressions and Equations – Students are practicing modeling and writing algebraic expressions. They will have had some indirect experience with this through coding and word problems. We will be using both the Eureka & GoMath workbook sheets to help with this concept. Language > We are starting a new book called Flush by Carl Hiaasen. The premise of the book is set in Florida, about a boy who wants to vindicate his father’s imprisonment related to environmental issues. This topic will go along well with our science unit for the quarter: Earth Science. Students will also continue adding to their blogs. These will serve as student work portfolios later in the quarter for conferences. Science > Earth Science & climate will be our next focus. We will be specifically discussing weather patterns and how the Earth’s water is related to weather and climate. As we go to 6th Grade Camp, many of these concepts will be strengthened through the YMCA program activities. Quarter 3 will prove to be a very FAST quarter. Please remind your children to keep up with their regular homework responsibilities and attendance. I’m excited to see where we are going in 2016! Language / Social Studies > We will be starting a new book, The Egypt Game, to connect with our Social Studies unit. 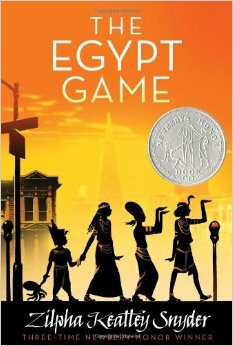 The Social Studies unit, is of course – Egypt! Each child should be getting his or her own copy of the book to use. Please remind them that this is still school property, and to be careful not to lose it. 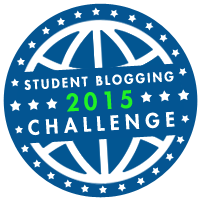 Blogging > The Student Edublog Challenge just got started this week. Students will be posting at least one topic each week for 10 weeks. They’ll also be able to follow other students blogs in different countries to learn more about their cultures and schools. Science > Life Science! Our science unit will cover plant and animal sciences, and more specifically cellular biology. San Diego is known for its innovations in the medical field. If you have information to share that can help students better understand biology research or environmental plant science, please let me know! I would love to have experts come visit. We could be lost! > Our DonorsChoose Project: Find Me a Treasure needs just $600 left to bring GPS units to our classroom. The deadline is November 13th !! We intend to share these with all of the Camarena campus on Geocaching walks. If you would still like to donate, please visit the link here, or pass this onto your social networks or places of business. Every bit helps. Camarena Fall Festival Silent Auction Basket > This year, Camarena is hosting a Fall Festival (instead of the Winter Wonderland). This will be the night of Friday, November 6th. Our class theme will be a Science Basket. If you can donate please visit this link so I can collect items. Last year, our Science Basket went for the highest bid of all the classrooms, at over $200! 6th Grade Camp > Forms went home for the Butter Braid Pastry fundraiser to help with camp cost. Students may fundraise until October 22nd. Orders will arrive November 5th. Your child will receive $6 for every pastry sold. YMCA Health History forms may also be filled out can be turned in any time between now and January. 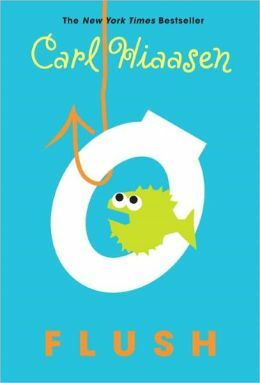 Weekly Blog Assignment: Mar. 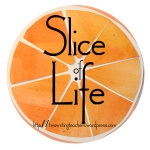 2-6 Slice of Life – Camarena Classes! 1) Camp Week Blog post: share about your (1) favorite class and your (1) favorite activity from Camp. Explain with detail to inform your readers. 2) Make two separate Student Portfolios tabs: Language & Math, and write your reflections. 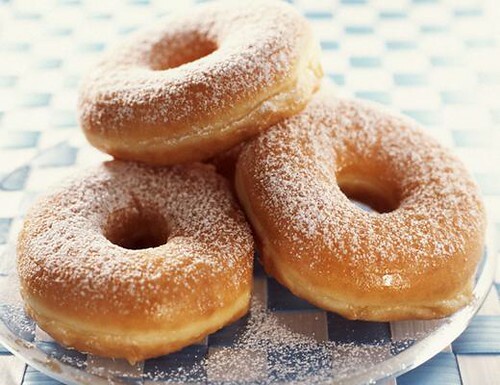 Be ready to have these for Monday for your peers to give you feedback. Camarena Classes are doing “Slice of Life” too!! Please visit these class pages and give them some feedback. Spelling Bee – Last month, each class sent a student to participate in the Camarena School Spelling Bee. We are SOOOO excited to have our own Patrick C. represent our ENTIRE 6th grade as the first place winner!!! He will compete tomorrow, Saturday Feb. 7th in the District Spelling Bee level. It will be at Camarena at 12:00. Come by to support him! 1) Thanks to all families for being prompt in sending in your camp dues & slips! We have nearly all of the 6th grade students attending. Students were able to pick their cabin bunk preferences this week, and they will know their roommates once they reach camp. We’ve reminded them that there are no guarantees who they get to bunk with, and the final decision will be made by the teachers. 2) Although I have access to your child’s medical information in the office, please remind me if your child has any allergies or dietary needs which the camp staff should be aware of. We will tell them in advance. 3) Finally, your child may start bringing in any extra money they may want to spend on the camp store. How much they spend is up to you. They are allowed to buy one snack and drink each day, and souvenirs. Prices were listed on the initial packet that went home. 1) Next week, Eastlake Middle will be visiting our campus TWICE during the school day. The first visit will be by the Eastlake Middle Band. They will explain to your child why band may be a good fit for them as an elective. If your child has NO experience with musical instruments, but you’d like for them to try it…may I say this is the PERFECT way to go about it, especially when it’s free! The second presentation will be from the Eastlake Middle school counselors. They will go over in detail about choosing classes for next year. Expect a registration packet to come home with your child which will need to be completed before the end of the month. 2) A separate Parent Orientation is scheduled at Eastlake Middle School on Thursday, Feb. 26 at 6pm. For those students who may be going to a different middle school, you should have received information in the mail describing “next steps.” Please contact the middle schools for clarification, or attend the Parent Orientation for more info. Download the flyer here. Valentine Day Swap – In celebration of Valentines Day, your child may bring in Valentines cards/candies for classmates next Thursday. We have 29 students. I will provide a separate list of first names for them to download on Edmodo. If your child chooses to bring valentines, please do not leave anyone out. They should bring one for EVERY CHILD. This is an optional swap. Please do not send cookies or desserts. SBAC (Smarter Balanced Assessment Consortium) – You may have heard and are wondering, “What IS this? ?” Last year, your child was exposed to the new state testing methods. This involved using computers rather than paper-pencil scanned test. Last year was purely to get the feel of how the test will be run, and nothing counted. This year, the scores will count. In February, we will take the Practice SBAC test, with the real test coming later in Quarter 4. This practice test will take two days. Spring Conferences – Already?!! Please save the dates of Thursday March 12-Thursday March 19 as Student-Led Spring Conferences. These will be minimum days. Your child will be reflecting the next several weeks on their reading, writing and math performances this quarter, and will be making a presentation to YOU on their conference date. More info to come. relaxing break with your children. I was happy so many great stories of their break. We have just started into Quarter 3, but we all know the month is now halfway over!! CAMP MONEY & MEDICAL HEALTH FORMS ARE DUE FRIDAY, JANUARY 30TH!! however these will be provided here for you to download. Students will attend a similar meeting for them on Friday during school hours. Happy December! I hope this email finds you and your family well-rested from our week-long break! I am looking forward to working with your children as we come back to school tomorrow, Monday December 1st! We are now heading for the tail end of our Quarter 2. Here are some things to know for this month. this Google Form link . Anything would be appreciated to represent our class. Please visit the school Camarena blog for other details about the Winter Wonderland coming Dec. 12th. Thursday Dec. 18th Gallery of Experts > This is an opportunity to see your child’s expertise in either social studies or science in an informal “open house” gallery. We will be hosting the gallery in our own classrooms from 3:00-4:00pm. We would like your child to stay after school if possible to field questions, however we know this may not be an option for everyone. Please take a moment, if your schedule allows, to visit these very special projects! Friday Dec. 19th Q2 Report Cards > As you may recall, during Quarter 1 conferences your child only received a report card detailing general behaviors, citizenship and homework habits. I was also able to show some samples of their work based upon Common Core expectations. Our school district has now finalized the official Common Core report card, and I will be able to give your child marks for subject areas taught for both Quarter 1 & Quarter 2. These will go home just before the Winter Break. 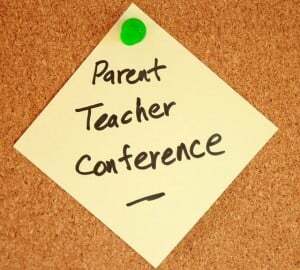 There are no parent conferences scheduled in the second quarter. However, I will be happy to schedule any informal conferences after the New Year, once you have had a chance to review the new report card with your child. Friday Jan 30, 2015 Camp Balance DUE > Camp Marston is in just two months! This week I will be sending home camp balance notices to remind of what your child needs to pay, as well as the medical health form. If your child has a history of asthma or other conditions which require a doctor signature, you may want to plan a visit to your provider well in advance to take of the paperwork. In January, we will have a parent informational meeting after school to review all the detail for luggage. Details to come. consistently. Students will be asked to work on these at their own pace during the week, with specific assignments due each Friday. Please be sure your child has Internet access to practice these math problems if completing at home. They will also have time in class to work on TenMarks as well. Language > Also, this week, I will be introducing another online program called NoRedInk.com. It will allow your child to practice grammar skills in context. They will get their own account login and be able to access it in class and at home. Just like TenMarks, students will be expected to work on assignments at their own pace, with specific due dates in mind. Science > During the vacation, your child was assigned to collect research sources and notes on the science topic of their choice. These notes go towards one of the Gallery of Experts projects. Please review with them the project outline so they are prepared in class. Happy Fall! I trust you had some time to relax your brains with your children – or least they did! Here are some important notes for this month. Report Cards > Thank you to all of who were able to attend parent-teacher conferences back in September. I appreciate your understanding for the District’s new report card, and hope showing some work samples gave you a better picture of math and writing standards for 6th grade. Many of the ideas and discussions I had with families I’d like to try to implement this quarter. If I still have not spoken to you regarding your child’s report card, please contact me for a phone conference as soon as possible. I am available by school phone until 4:30pm most days. in your child’s classroom. Just as we did last year, you are welcome to shadow your child from 8:15-9:30am. Room 414 will be reviewing some PE skills, then taking on dividing fractions. Come by if you have a free moment! Camp Fundraiser > At conference time, I mentioned to most parents that 6th grade did not plan for any camp fundraisers. However, that has now changed. Your child received an order form to sell Butter Braid pastries. You can check out their website here: https://www.butterbraid.com/ This is completely voluntary, but will certainly help subsidize the camp cost. You child will earn $6 for every pastry item sold. Orders are due October 24th, with the items delivered flash frozen on November 6th – just in time for the holidays. If you have sent in money towards camp, I can refund that amount to families.